The big question for new House Dems: Will you back Pelosi? WASHINGTON (AP) — It’s the thorny first question confronting newly elected House Democrats: Will you vote for Nancy Pelosi? Even before they’ve taken office, the freshmen swept in by the midterm elections are caught at the center of an escalating power struggle over Pelosi’s future. The clash intensified Monday as Pelosi’s critics unveiled a letter signed by 16 Democrats, including five freshmen, vowing to oppose her. If that holds, it could be enough to derail her bid. If not, she could reclaim the gavel she once held. The vote on a new speaker will be among the first cast in the new Congress, a dramatic roll call that often becomes fodder for campaign ads. For many of the Democratic freshmen, it’s a moment of truth after a number of them promised on the campaign trail to oppose Pelosi and demand new leadership. For now, just five freshmen have signed onto the letter opposing Pelosi. Two of them, Anthony Brindisi in New York and Ben McAdams in Utah, are in races that have not yet been called by The Associated Press. Other freshmen who have said they would oppose Pelosi did not sign the letter, and the fight for their allegiance is raging behind the scenes. The showdown is splitting Democrats after they took control of the House in the midterm elections, overshadowing what would be the historic return of the first woman to ever hold the speaker’s office. On the one hand, Pelosi’s supporters say now more than ever the party needs the California Democrat’s leadership as a skilled strategist and tireless fundraiser to confront President Donald Trump and Senate Republicans in Congress. 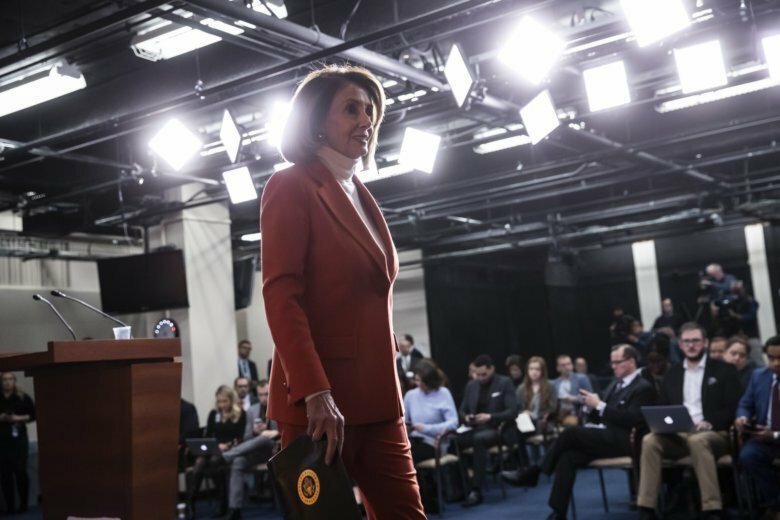 On the other, Pelosi’s critics say she has become such a weight on the party, starring as the chief villain in Republican attack ads against Democrats, that she needs to step aside and make way for a new generation of leadership. Among those leading the effort against her, Rep. Seth Moulton of Massachusetts has said his group is trying to protect the freshmen so they can survive their re-elections without having Pelosi’s image hanging over their campaigns. The Pelosi opponents’ theory is, once it’s clear she doesn’t have the votes, a new leader will emerge. All of the freshman opponents so far are men, and Pelosi’s critics have been criticized, especially on social media, as being led mostly by men. Just two of those signing the letter are women. Several high-profile freshmen who have vowed to oppose Pelosi are notably missing from the letter. Rep.-elect Abigail Spanberger of Virginia said Sunday on ABC she had “tremendous” respect for Pelosi, who “blazed a trail” for the record number of new women, but would be voting against her. She has not signed on. Pelosi’s office insisted Monday she has the backing to become speaker again. “Leader Pelosi remains confident in her support,” said spokesman Drew Hammill. With the Democrats holding 232 seats, Pelosi can’t afford to lose many votes and still hold the 218 needed to become speaker, presuming all Republicans oppose her. That margin could shift, though, if lawmakers are absent or simply vote “present,” which reduces the threshold. Her supporters say that after winning difficult elections against Trump’s campaigning, the Democrats can’t afford to get bogged down in a protracted leadership fight ahead of the Jan. 3 vote. They are heading toward an internal caucus vote when lawmakers return from the Thanksgiving recess that will test Pelosi’s support. One potential rival, Rep. Martha Fudge of Ohio, did not sign onto the letter. That’s a similar tack to the one taken two years ago by Fudge’s ally, Ohio Rep. Tim Ryan, who challenged Pelosi during internal caucus elections. Fudge has said she will decide after Thanksgiving if she is running. Republican Rep. Tom Reed of New York, a Trump ally who has said he could vote for Pelosi if she agrees to rules changes to move power away from the speaker’s office, warned freshmen against waffling. Some freshmen appear to be moving in Pelosi’s direction.